The B&W film tuition thing I've been starting is slowly getting some traction, so that's where my gear expenditure has been directed recently. Today I took a quick setup photo of the medium format gear I've gathered for demonstration and use by participants should they wish to take a real plunge, and I thought to post the shot here as a point of interest. 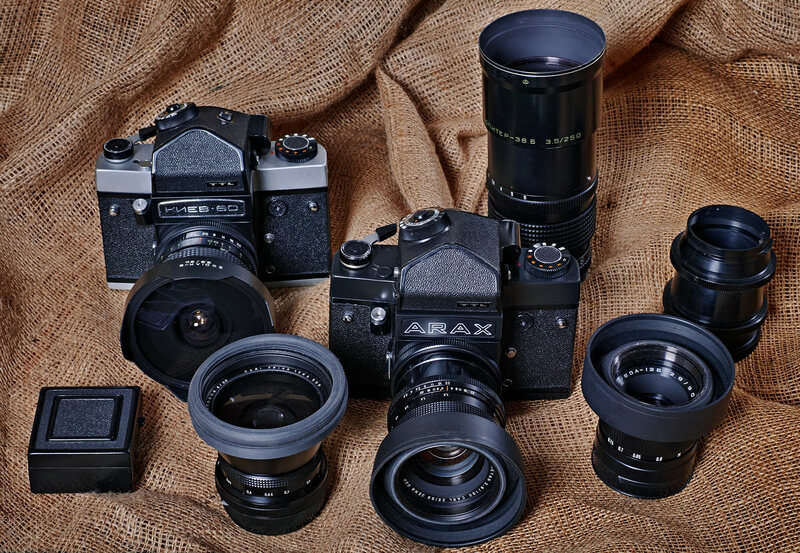 A bit of mental arithmetic had this entire outfit costing around US$1,100 and comprising two Carl Zeiss jena MC lenses (50mm & 120mm) and three Soviet lenses (30mm fisheye, 90mm & 250mm) all based on Zeiss designs and produced using equipment shipped to the USSR after the war along with a good deal of the German staff who didn't manage to get to the West and the new Zeiss Oberkochen factory before the curtain went down in 1953. As well it included a waist level finder & set of extension tubes. That's around what just a Nikon APS-C size D7500 without any lenses costs..... all from eBay. It seems relatively recently that the photography world considered film photography as being way to expensive and digital oh-so cheap. Sure film is an ongoing cost, but the amount of film that can be bought with the amount a new digital body costs every 18-24 months is, well, huge. Really happy to hear that it is going well with the tuition, Alan. You should start a film shooters club on here. Small steps, Dallas - there is still a lot of hesitancy from people who, in much the same way as Cold War propaganda convinced us that Soviet Bloc photographic gear was rubbish, have been convinced by computer and digital camera manufacturers that film is bad, expensive, and not worth even considering. There are now quite a few Facebook film shooters pages growing at rather hectic rates, so it appears that this is perhaps a coming thing. From a personal point of view, watching attitudes change as the satisfaction of achieving something so utterly hands-on and manual in operation compared to the electronic trickery of digital photography actually dawns on them gives me genuine pleasure, just as re-entering the darkroom after nearly a decade of absence did for me - particularly that now it is on my own terms and not just to fulfil some client's order. At that level it's incredibly easy to get hooked on this as a hobby rather than as work.